Irene Buchine was a creative director in her own successful advertising business before she refocused on helping small business owners position their businesses. Her project portfolio did not speak to this new value she now sought to provide, and her personal story was a vital part of her brand, but it needed to be communicated properly. 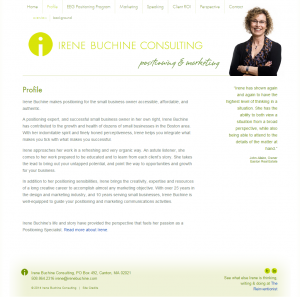 Working with DPS, Irene’s many drafts of self-generated marketing copy, as well as her bio, came into sharper focus. Irene had been reluctant to launch her website until these issues were resolved. Working closely with Irene and her web designer, we renewed Irene’s confidence in the effectiveness of her website as a marketing tool. We both recognized right away that Irene’s marketing materials needed to clearly distinguish positioning from a cluster of services it was easily confused with – both so that it could be her primary differentiator, and so that her previous work could also be included. We helped her become clearer about her service by bringing together ideas she had generated from several different vantage points. As a result, her work’s real value to customers became clearer. We refined her story into a short-form professional bio, and a longer personal narrative that went deeper into her background and life lessons. This gave website visitors a sense of Irene’s ability and spirit that balanced authenticity with authority. Each version contributed to positioning her consulting practice, and making her message, products, and style appeal to her small business clientele. 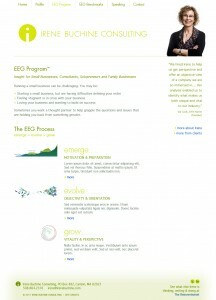 This clarity led us to crystallize Irene’s process in a positioning program called EEG that would be prominently featured on her redesigned website. Together we explored each of the three steps of the process in more detail to identify customer needs and outcomes. We developed copy for each page to inform her audience of the value throughout the whole program and the added benefits of a marketing program built on a well-founded position. Under Irene’s direction, we collaborated with Irene and a web and graphic designer to devise companion images and appropriate navigation. Results: Irene’s previous clients, who have experienced her service and her results, are the best sources of input for how effectively her new website presents her. Many have remarked that the content is clear and fluid. The Concept – We had to distinguish positioning apart from similar but related marketing services, and make Irene’s approach a clear value to a small business owner with a limited marketing budget. 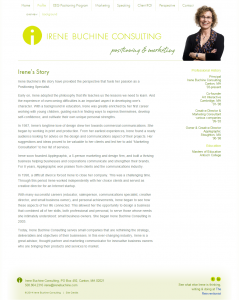 The Back Story – Irene’s story was nuanced, but it was an essential feature of her website and brand. She needed it to be both complete and authentic, but also professional. We broke it out into two versions: A short professional bio showcased her career highlights; A link to a longer story on another page allowed a reader to explore the transitions and life lessons that are important parts of Irene’s philosophy, and typical of what she brings out in her clients.